R-Good's has been in business since 1986 and has been creating award winning cars, trucks, and bikes ever since. Whether it is insurance work to full blown restorations or hot rods you can be assured that with us you will have the car, truck, or bike of your dreams. We do not skimp on quality and with our reasonable rates you will get the best work done in the Rocky Mountain Region. Year after year R-Goods continues to build the regions best award winning hotrods, muscle cars, and street rods in the midwest. Our vehicles have won every type of award you can imagine. As the automotive industry changes we continue to grow with it. Whether it is improvements in engine management systems for engine swaps or suspension improvements we are right there to make sure you have all the information you need to make informed decisions for your build. We work close with the customer to build unique creations offering the best advise and direction during your build. Whether you are building a super nice driver or a full blown show car we can help make your build a reality. We work closely with you and your budget so whether it is only handling the paint and body work or doing the entire car we have a build to match what you are looking for in a builder. We have helped many customers over the years to realize their dreams by restoring their rides. We have worked on all types of rides and we make sure it is built to factory specs right down to the proper clamps, bolts, and batteries. It is not a restoration if you change the slightest thing on the car from its original condition so we make sure it is built using all the right parts. Just like our customs we work closely with the customer to make sure we build the car the way they want it. We will make suggestions and help you all along the way to make sure you have all the information you need to restore your vehicle to its original state. R-Good's Creation Taking National Show Circuit By Storm! 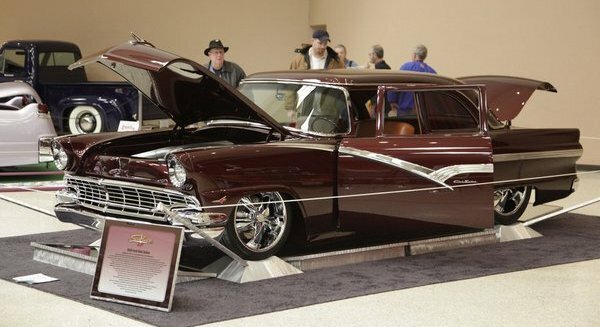 Read More About This 1956 Ford Here! Bob & Polly Zetterman's 1957 Chevy Convertible.